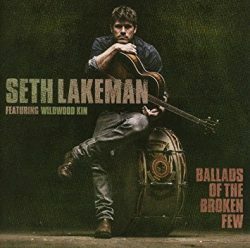 Seth Lakeman will re-release his album ‘Ballads of the Broken Few’ (pictured left) with five added bonus tracks on September 15th via Cooking Vinyl. Recorded during the original album sessions, with producer Ethan Johns, the previously unreleased bonus tracks are: Gambling Man, Everything, Days Are Longer, Wake Up and Bury Me Deep. Everything, featuring Wildwood Kin – sisters Emillie and Beth Key and their cousin Meghann Loney, who were a part of the album recordings – will be Seth’s new single, out on September 22. This coincides with his performance at BBC Radio 2 Festival In A Day at Hyde Park on September 10. In the meantime, listen to his track “Morning Song” below (not off the last album) because, er, it’s the morning.